When I was a kid I used to collect Panini Football sticker albums, not because of the football, I hated football and still do, no it was because of the collecting. You would go into school with your half-filled sticker book of perm and mullet wearing soccer stars and your collection of duplicates and go through the ritual of swapping stickers with your friends, often to the chorus of 'got, got, got, need, got'. I mention all this because Res Publica 2230AD boils down to replicating that sticker book collecting but with sci-fi aliens and an even more limited vocabulary than my 8 year old self. Red Publica 2230AD is all about set collection and trading. The game works by building an increasingly complex tableau of cards in front of you that give extra options and more importantly victory points. To build these cards you need to collect sets from one of two decks, races and sciences. You'll gain new cards at the end of every turn but to get the cards you need you're going to have to trade with other players. The rub here is you can't just open up with negotiations, instead you are very limited in what you can say when you offer a trade. You can only say "I have X to offer" or "I am looking for Y". Players can then only respond with the other half of the the trade. The result is counter intuitive as people want to barter, they want to negotiate but instead Res Publica 2230AD forces players to simply swap two cards based on a very structured statement. If was given a pound for every time I had to remind players how the trading works, then I would have paid for this game a couple of times over. It feels far too rigid and, especially at the beginning of the game, can mean that actual trades are few and far between. The problem is magnified if the luck of draw means that the cards people are looking for just aren't coming into play. When this happens, and it happens a lot more than it should, the game grinds to a halt as everyone spends their turn either offering up unwanted trades or simply skipping the trading and taking cards. Once you understand the limited trading rules there is some strategy to be had, and the game rewards those that change what they're collecting based on what other players are looking for and offering in trades. Once players have a large enough hand for actual trading to start, then the game starts to flow but it takes a bit of time for Res Publica 2230AD to gain momentum. As players bring more and more space stations into play, then the faster the technologies deck gets depleted. When the deck is empty the game ends so as players grab more technology cards the game runs faster and faster to its conclusion. It starts to put more and more pressure on the game. 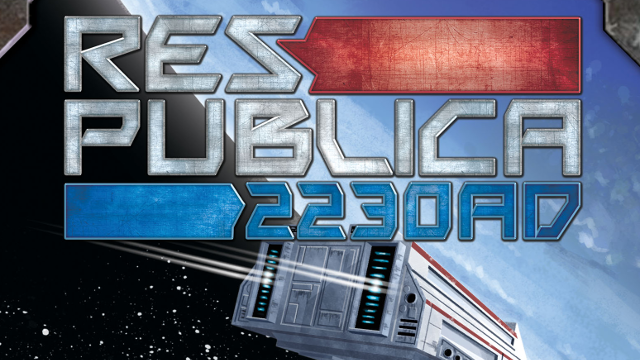 Res Publica 2230AD’s biggest issue however is that the game just isn't very exciting. It takes too long to get started, due to the limited number of cards in play, and then when it does get going it overstays its welcome, the game ends up lasting about 15 minutes longer than the fun allows. If Res Publica played in 30 to 40 minutes, rather than the hour it actually takes, then I would be more supportive of the game and maybe there's some leeway in tweaking the rules with the opening hand or allowing more negotiation in the trades. There is a market out there for Res Publica 2230AD but I'm afraid it's not me. The constrained trading rules means that the game either grinds to a halt or feels increasingly frustrating and I can imagine that by making the trading an actual negotiation some fun could be found. There is a chance that experienced players might get more out of the game, understanding the trading concepts and gaining an appreciation of the rarity of certain cards but I can't justify the time investment of playing a boring game 10s of times on the off-chance it might get better.